Where do you find a salt-water swim without an ocean in sight, a bar that isn’t a bar and a British-style phone booth rumored to harbor secret powers? … In the bustling town of Phoenixville. You know you’ve arrived when charming bright blue lampposts beckon you across the Gay Street bridge or down Bridge Street into town, and matching sidewalk benches invite you to sit and stay a while. Welcome to the new lobby of The Colonial Theatre, bigger and grander than ever. The shiny grand piano reflects magnificent features from every angle: marble floor, glass ceiling and decorative wrought iron railings that pay tribute to Phoenixville’s historic ironworks. A 30-foot concession stand serves wine and beer as well as popcorn and Goober favorites. From the Colonial’s lobby, head upstairs to the new Garden Suite with wet bar, projector and screen—perfect for weddings, fundraisers and Spiderfest horror movie marathons. Glass doors open onto a deck where spectators can watch Phoenixville fireworks. The spotlight, however, shines on the theaters—two new and the longtime classic, each with its own character and entertainment befitting the venue. The chic blue theater has tiered seats that retract to reveal a large floor for dancing and entertainment. Downstairs, past a sconce-lit brick hallway the plush red theater is designed like an old Hollywood screening room—an intimate space perfect for live musical quartets or movies from eras past. The beloved main theater still hosts Blobfest and silent movies—including a showing of the dramatic 1925 version of “Phantom of the Opera”—complete with live pipe organ music. For a bar that’s not a bar, enter Cameron Peters Floral Design. Who knew that rows of red roses, golden sunflowers, yellow calla lilies and more were called a stem bar? BYOB (bottle) or buy a vase, pick your favorite blooms, and get creative. Or ask Cameron to design an arrangement for you. “People get used to clicking a button to shop. By doing that, they miss what’s freshest, in season, or their favorite colors,” says Cameron. At her new shop, she’s changing those views one arrangement at a time. Beyond Phoenixville’s many breweries, wineries and distilleries (see sidebar), there are also unique tasting rooms. A Culture Factory on Morgan Street promises distinctive tasting experiences. The tasting room that Chef Olga Sorzano—founder of Baba’s Brew—opened four months ago offers Saturday tastings, pairings and classes about fermented foods we love: cheese, chocolate, yogurt and her signature kombucha. For Baba’s Brew kombucha newbies, tastings are the time to try the handcrafted brewed and fermented sweet tea that begins with an Old World recipe from Sorzano’s Siberian great-grandmother. Say yes to fresh pita for sampling olive oils at TASTE. The space that reopened as a vegan restaurant invites customers to try blood orange and Tuscan herb olive oils; vinaigrettes and Sandcastle wine. The menu looks anything but vegan—ice cream sundaes, filet, Portuguese chicken and sausage—but all food is plant-based. Throughout town, there’s easy access to places to live, work and play. 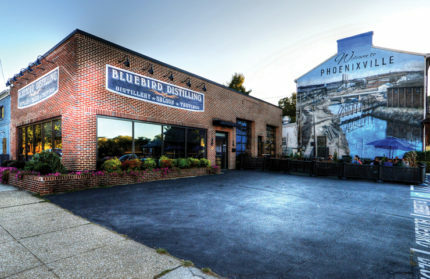 Find Phoenix Village by its brilliant firebird mural on the end of the building. Dubbed a community within a community, the apartments attract young professionals and empty nesters partly because of common areas and events that foster social life—outdoor parties by the heated salt water pool and hot tub, grills and fire pit. At the juncture of the French Creek and Schuylkill River, aptly named Riverworks lets you live at the center of the town’s action on the site of the old iron and steel mill. Styled as a base camp for exploration and fun, six apartment buildings near the Schuylkill River Trail (running all the way to Philly) also share a 24-hour fitness center. A new spot combining the best of professionalism and creativity is WorkSpace. Owner David Johns “gets” what businesspeople need to get to work: a conference room, wifi, videoconferencing, monitors, printers, lockers, coffee, consulting services and more. Different packages give solo techies, consultants, artists, globetrotting professionals—and large businesses with temporary needs—space for work or collaboration for a day, a month or longer. Recently a parent who needed to bring a youngster to work discovered a special use for WorkSpace’s British-style red phone booth. The small superhero played in the booth—used for phone call privacy—and later emerged with superpowers, while the parent achieved heroic amounts of work. For some area residents, work is play. Kolbie and Remy are recipe tasters for “doggie ice cream” at Maddie’s Castle, a shop offering pet treats, toys and more. So far, the four-footed tasters have approved six flavors including popular Rocco’s Bacon Blast and Koda’s Peanut Butter Banana Blitz. The frozen dog-safe treats are available by the cup and free during First Friday Yappy Hours. Pennsylvania native Anna Spackman and her guitar moved to the heart of Phoenixville a year ago after six years in Portland. A community scene nurturing emerging musicians and a cornucopia of art and culture drew her. Eclectic markets and festivals—Lulu’s Vintage Flea Market, monthly Punk Rock Flea Market at “The Pick” (Pickering Creek Inn) and summer’s Colonial Theatre “Monterey Pop” celebration of the legendary festival—and more keep her here. Spackman recently founded the Wild Minds Writers’ Circle for poets, songwriters and storytellers. Lyric by Spackman, musician Street Greek and others—inspired at meetings held at the Artisan’s Gallery and Café and Steel City—are found in concerts along Bridge Street and elsewhere. 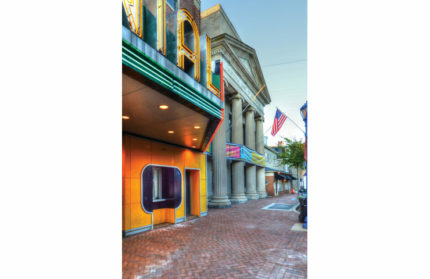 Visit Community Arts Phoenixville for year-round gallery exhibitions, concerts and workshops. The town has a few new eateries, too. Below Phoenix Village, Chikara Sushi & Asian Fusion welcomes hungry patrons looking for Bento boxes, dinners or sushi—under outdoor umbrellas, at tables or at the alluring bar. A second Liberty Union Bar and Grill offers flavors from around the nation. The week I was there, menu items included the special, Nevada clam casino bites, and mainstay dishes of California wraps, New York wings and classic American burgers and beer at the bar under the American flag. With all the great finds in Phoenixville, all you need is an appetite for food and fun! Phoenixville is the Right Place to Have a Brew! The beer selection in this town really shines. Did you know Phoenixville ranks 10th nationally in beer places per capita? That’s just after Seattle and some towns in Oregon and Colorado! And well ahead of West Chester at number 30. Six breweries—yes, six—call Phoenixville their home, from old timers like Iron Hill, Sly Fox Brewing and Stable 12 to newcomers Crowded Castle Brewing Company, Root Down Brewing Company and Rebel Hill Brewing Company opening soon, along with even more places in nearby towns. Here’s a quick cheat sheet to guide your visit. Fine hand-crafted ales and lagers in a warm and friendly brewpub in Collegeville. Now on tap, Give ‘Er Helles, Helles-style lager developed for Oktoberfest in Munich in the late 19th century. 50 West 3rd Ave. & Chestnut St., Collegeville 484-973-6064; ABCBrew.com/team/Collegeville. Crafting unique beers, their specialities include IPAs, ales, porters and stouts. While they do offer a tasty small-bites menu, you can bring food into the taproom with you or have it delivered from a local restaurant. 240-242 Bridge St. 484-252-0077; CrowdedCastle.com. Great beers from around the world with 17 beer tap lines, 2 draft wine lines and 1 nitro beer line, along with a solid menu of Boars Head meats and cheeses and featuring Saint Peters Bakery breads. 325 Bridge St. 610-933-1150; FooderyBeer.com. For over 20 years, their craft beers and handcrafted food inspire one another in unexpected ways. Try one of their signature beers, beers on tap or bottled reserves. 130 Bridge St. 610-983-9333; IronHillBrewery.com. Coming soon, this planned 7-barrel brewhouse will specialize in craft beer styles such as IPA, pale ale, saison and stout. 420 Schuylkill Rd. RebelHillBrewing.com. Vaulted ceilings with wood beams from side to side of the huge space that was formerly used for brewing … root beer. Great beer menu (and awesome food menu) including some wine and ciders. 1 N. Main St. 484-393-2337; RootDownBrewing.com. Founded in 1995, it’s one of the oldest brewpubs operating in the Delaware Valley. They have a national reputation in the world of craft brewing. 520 Kimberton Rd. 610-935-4540; SlyFoxBeer.com. This is what happens when three beer-loving high school best friends decide to adopt a new hobby after college, focusing on something they all love … beer. Try a Rodeo Clown (Russian Imperial Stout), Wild West Coast IPA or a Cherry Pie Hard Cider. 368 Bridge St. 610-715-2665; Stable12.com. Located in nearby Royersford and focusing on American twists on Belgian-inspired beers with something new offered all the time. Food trucks include Capt’n Chucky’s and Haute Wheels and special events include yoga and live music. 326 N. Lewis Rd. #240, Royersford. 484-938-5900; StickmanBrews.com. You’ll find them in Spring City, serving up treats such as Tuned Up Rye Bourbon Barrel Porter, Tuned Up Scorned Woman and Tuned Up Little Booty Stout. Music and food trucks are an added bonus. 135 N. Main St., Spring City. On Facebook. Under the Gay St. Bridge. Sat, 9 to 1. PhoenixvilleFarmersMarket.org. The annual benefit for Phoenixville Public Library. Wine tasting, dinner, silent auction and presentation. Rivercrest Golf Club & Preserve, 100 Golf Club Dr. Tickets $85–$125. 610-933-3013; PhoenixvilleLibrary.org. Four days of music, vendors, food trucks, crafts, a movie in the park and much more. For details visit PhoenixvilleChamber.org. Zombies try to capture flags. Benefits local charities. Corner of Bridge St. & Main St. PhoenixvilleZombieRun.com. Purchase a simple meal of soup and bread served in a bowl handcrafted by an area artist or student. Benefits PACS. The Covered Bridge Room at Kimberton Fire Co., 2276 Kimberton Rd. 5 to 8. $25. 610-933-1105; PACSPhx.org. Nov. 10, Béla Fleck and Abigail Washburn; Nov. 30, Richard Thompson; Dec. 3, City Rhythm Orchestra; Dec. 8, The Weight Band; Dec. 14, Aimee Mann; Dec. 21, Charlie Brown Jazz; Dec. 29, Ben Bailey from Cash Cab; Dec. 30, Delbert McClinton. 227 Bridge St. 610-917-1228; TheColonialTheatre.com. Dinner, music, dancing and a silent auction with great items. Benefits Phoenixville Area Senior Center. Phoenixville Country Club, 355 Country Club Rd. 5:30. $90. 610-933-3070; PhoenixvilleChamber.org. Artisans and vendors display hand-crafted treasures at this holiday shopping benefit for the school. 413 Fairview St. 9 to 3. 610-983-4080; www.RAK12.org. Nov. 19, Wurlitzer Show of Shows with Pierre Fracalanza. Dec. 10, Holiday Concert. The Colonial Theatre, 227 Bridge St. 2 pm. $5–$10. 610-917-1228; TOSDV.org. The parade starts at 7, from the 300 block of Bridge Street, then along Bridge St. for the tree lighting at Bridge and Main Sts. at 8 pm. 610-933-8801; Phoenixville.org. Beautifully decorated homes and churches, crafts, music, refreshments. Benefits Ann’s Heart Code Blue Shelter and Firebird Theatre. Tickets available after 2:30 at St. Peter and Paul Ukranian Catholic Church, 301 Fairview St. $25. 610-933-9181; PhxHolidayTour.weebly.com. Burning of the Firebird (Phoenix) will be at Friendship Field (at Franklin Ave. & Fillmore St.). The fun begins at 3, burning of the Phoenix at 8:15. 610-933-9199; FirebirdFestival.com. A premier food, wine, beer event. Live music. Benefits the Good Samaritan Shelter. Phoenixville Foundry, 2 N. Main St. $85. 6 to 10. 610-933-9305; TasteOfPhoenixville.com.